When you think about truly special seasons in any sport, these are always images and moments that immediately come to mind. The more magical the season, the more of these moments you have to look back on. Take the 2015 Cubs season for example. Remember Rizzo's tarp catch? Bryant's home run that almost cleared the scoreboard? Addison's flip to second? 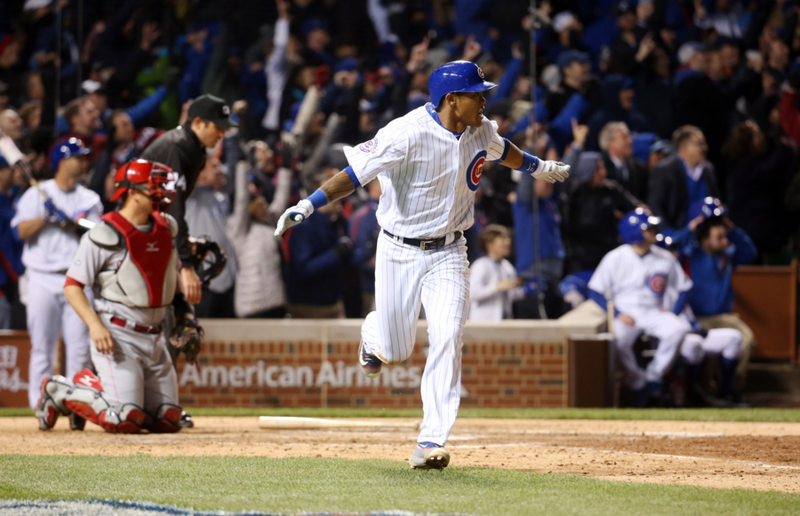 Rondon's fist pump after closing out the sweep of the Giants at Wrigley? Schwarber's bomb in the NLDS that landed on top of the scoreboard in right? There's a pretty good chance that with just those quick descriptions, your mind conjured up vivid images of each and every one of those moments. Those are the moments that you remember where you were when they happened. They define the seasons that stick with you forever. 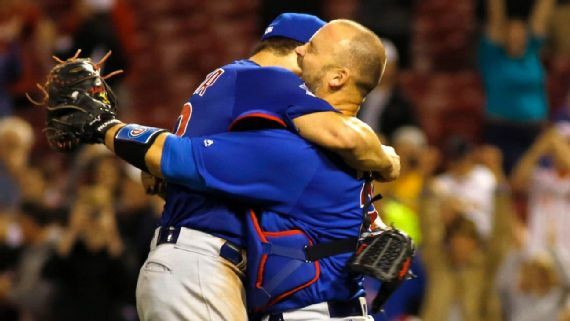 We're only three weeks into the baseball season and the Cubs have already delivered two of those moments. The first was Addison Russell's go-ahead home run during last Monday's home opener. It's pretty hard to have a playoff-like atmosphere in the first of 81 home games against a terrible team, but that's exactly what happened, and replays of Russell doing his airplane impression are going to be in so many hype videos this season. I don't need to give you all the stats and trivia about how amazing it is that Arrieta threw 2 no-no's so close to each other because if your phone is anything like mine, it threw all of them at you all night last night. Let's just all let the greatness of this Cubs team and the best pitcher in baseball wash over us and keep in mind that it's only been 16 out of 162 games and we have a whole summer of excitement to come. 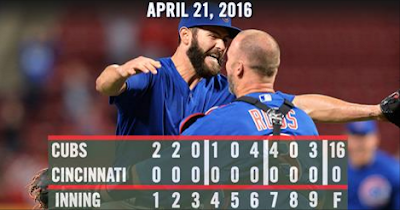 MVP: Jake Arrieta, obviously. He may not have been the most dominant we've seen him as far as strikeouts go, but he was in complete control the entire game and there wasn't much doubt that he was going to finish off the no-no when things got to the 7th inning or so. He was locked in. And this Reds lineup isn't full of a bunch of stiffs either. I mean, they're no Murderer's Row, but Votto and Bruce and Suarez and Phillips are all legitimate bats. Speaking of legit bats, Arrieta had two more base hits and a walk, bringing his average up to .273, higher than Rizzo, Heyward, Soler, Zobrist and Russell. Dude can rake. Greg Vaughn MVP: Remember Greg Vaughn? If that name sounds familiar, it's because he's the guy that hit the quietest 50 home runs in MLB history. No one remembers that he hit 50 dingers because he did it in 1998 when Sosa and McGwire did their whole steroid fueled run into the record books. But like, 50 home runs is a lot! Way to pick a time to get overshadowed, guy. There are actually a ton of Greg Vaughn MVP awards to go around last night. On any other night, we'd be talking about Bryant's monster game, with 2 homers (including a grand slam) and 6 RBI. Or Zobrist's first home run as a Cub. Or David Ross' awesome old man home run and subsequent dugout hip thrusting. But no, this was no ordinary night, so all of you take a backseat to the reigning Cy Young winner. HIS ERA IS ALMOST LOWER THAN HIS WHIP. HAHAHA LOOK AT YOU: Now I wasn't there, so this could be off by a bit, but from what I saw on television it looked like there were about 60 people a the game last night. Way to go, Cincy! We get to play the Reds for 3 more games in a row??? Really??? HAHAHAHAHAHA awesome. The Cubs are back at it at 6:10 CST with Jon Lester vs something called a Jon Moscot. JON v JON! NO H'S ALLOWED IN THIS CAGE MATCH! God, I wish we could play the Reds forever.